Back then, people blamed the “crying sins of the nation” and saw it as punishment by God. The government declared 19 January 1704 a day of fasting, saying that it “loudly calls for the deepest and most solemn humiliation of our people”. Apparently, it remained a topic of preachy sermons well into the 19th century — until it was more useful to forget it and pretend the weather was always nice until people drove SUVs. Ponder that if cooler conditions prevail we may end up with a more extreme climate, worse storms and more extremes both up and down. Then the Eco-Worriers will claim they were right about everything (except for “average temperatures”). 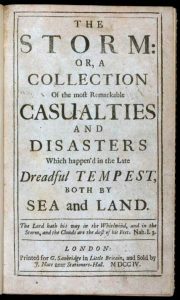 Was 1703 the worst storm ever? The storm uprooted thousands of trees; blew tiles from rooftops, which smashed windows in their paths; and flung ships from their moorings in the River Thames. A boat in Whitstable, Kent was blown 250m inland from the water’s edge. As Britain slept, the wind lifted and dropped chimney stacks, killing people in their beds. It blew fish out of the ponds and onto the banks in London’s St James’s Park, beat birds to the ground and swept farm animals away to their deaths. Oaks collapsed and pieces of timber, iron and lead blasted through the streets. The gales blew a man into the air and over a hedge. A cow was blown into the high branches of a tree. Lightning kindled fires in Whitehall and Greenwich. From the hours of five in the morning until half past six, the storm roared at its strongest. It is thought between 8,000 and 15,000 people in total were killed. 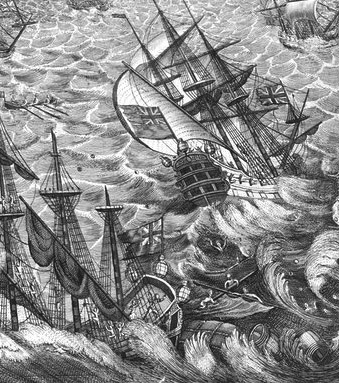 Wikimedia commons: See the full art Goodwin Sands engraving of the Great Storm. Since that was climate sarcasm, I assume you meant 97% worse. The worst storm since 1703 was in 1987, which mostly impacted South-East England. About 15 million trees were uprooted and London was without power for the first time since the miners strikes in the early 1970s. There were far less dead – just 22. It also only lasted a few hours, so nothing like the 1703 storm which lasted 8 days and covered a larger area. The Met Office has more details. Then there was the Great Storm in 1953. The death toll was higher. Not sure about the winds. In 1987 we were living in central southern England. In the house we were in at the time the main bedroom had windows on opposite sides, northish and southish facing. The wind was fast and furious from one side, then there was a calm period, then fast and furious from the other. There was immense damage over a lot of the south. That day I had planned to take our completed forms to emigrate to Australia up to Australia House in London but couldn’t as there were trees down over the railway line at Fleet. I had to wait until the following Monday to travel, deposit the forms and have a good read of The Age property columns. When I emerged there were newspaper hoardings about the Stock market crash! What a time. The Met didn’t see a depression developing over the Bay of Biscay. I had a job interview about 20 miles cross-country from my NW London home – as I got up to drive to the interview, my wife suggested that I might like to tale a look outside….. I left as soon as I could, and arrived after a 3 hour journey spent picking my way through the fallen trees and assorted debris. The interviewer arrived two hours late, as a mature tree in his back garden had completely eradicated his bathroom and one of his bedrooms. During the interview, he seemed distracted, and I didn’t get the job. There is so much more in this fascinating work. The details of this storm and links to the stories should be posted in the comments section of every ‘worst storm ever due because climate change’ article. Ah, the great Peter Cook! John Wesley was but six months old. He would have to survive a house fire a couple of years later but, that said, perhaps there is some sort of hope after all. Hope lay at the bottom of Pandora’s box. Some say “timing is everything”. And so we shall see. And that was in the days when population densities etc were much lower than today. Storms, fires etc tend to be much worse nowadays, in terms of destruction, because of population growth and their spread. I hope that the next big storm we get destroys all our windmills (the unreliable electricity kind, not farmers’ water pumping kind). Interesting that even the wooden gear ones caught fire just like the “modern” kind. Well if we ever did get one of those major storms again they would be destroyed, along with many other structures. So far we haven’t had one, which proves that man-made emissions have at best prevented such storms or more likley have no significant impact at all. It’s time our PM came out and announced all this and pointed out that as a result the global warming/climate change alarmists are economic terrorists. And i thought it was the end of the world because there was more frost this morning, and my potatoes have turned to mush, avocado trees severely burnt, and to save money on heating, have to keep using the hair dryer to blow hot air under my clothes for instant relief from the cold. Surely because this happened so long ago it no longer counts , they only look at the last 30 years for records unless it suits them otherwise. The only way they can say unprecedented or a record is to cherry pick the time scale or reduce history to a few years . Yes RR – I always smile wryly when I see “worst in living memory” from some cub reporter whose “living memory” is about 1/3 of mine. How many of these reporters were around for Cyclone Tracy? I was, and I was in Darwin exactly one week later to help with the recovery and I can tell you the devastation and the evidence of the wind strength that they experienced was truly mind blowing. The ski season at Perisher has been extended into the NSW school holidays – that strange wonderful thing that children will never know. I seem to recall that the industry should have been dead by now. And in Sydney so far, we have had two days of Spring, yesterday and last Saturday. But then Spring doesn’t really start until Sunday so it is not surprising we are having wintry conditions. Out of curiosity, does anyone know when, who by and why the decision was made to have calendar based seasons rather than base it on the vernal equinox? Not sure why this appeared as a stand alone post – I was replying to Environment Skeptic! The ski season in Victoriastan has also been extended until October 7th. King Coal, we’ve done it before. Calendar based gives a better idea of a proper start to summer and winter. Having the first day of summer being the longest day of summer is a bit dippy don’t you think? It might be the longest day and sometimes it can be hot. Is there not, however, a time lag for the warmer weather to heat up the sea around the coast? I consider the equinoxes and solstices the season changes, whatever the Met Office and BOM now choose to do. It is still late summer here, only just beginning to look as if autumn is arriving with the gales. There’s certainly a lag, but if you divide the year into 4 equal seasons, 13 weeks each, having 3 weeks before the solstice and 10 weeks after already has a fair lag built in. It’s all pretty arbitrary though. according to this map the warmest day of the year in the USA varies from early June to some time in September, depending on where you are. William, seasons are defined by characteristics of the local climate and ecosystems and not our nearest star or the tilt of the Earth towards said star. Of course the tilt determines the amount of energy falling on the planet and therefore the timing of the seasons but climate at ground level is affected by a lot more. As it happens, for temperate climates, the months fit the seasons rather well. You didn’t think that one out very carefully, GA. It’s rather muddled and confused. There are the definitions of the seasons. To help you out, I’ll mention the words: Length of Day. It’s purely astronomical. What weather we get during those seasons, is, well, just weather. The weather doesn’t define the season but we have, from experience, reasonable expectations of what we will get. That’s why we have the two words seasonal and unseasonal in the language. They account for some variation. The environment is built by, initially, plate tectonics and then by the weather. seasons are defined by people living in a place to describe regular patterns in the environment in which they live so as to develop patterns of behaviour to maximise their survival in that place. The length of day is interesting bt more interesting is germination, pollinators and leaves droping not astrophysics. It’s called spring where we live ! Also, why won’t children know about the changes to the ski season? I’ll go and tell a few now so you won’t need to write that silly line again. You know exactly why GA…warmist pundit said our children wouldn’t know what snow is. Not only did we have frightful cold, snowy, icy winters in England after that but this year we had snow falling in Marysville (Vic) and the road closed to visitors from Melbourne hoping to play in the snow at Lake Mountain. I had no problem understanding what William was saying. So he wrote badly or was wrong. I realised that. People with those new degrees in Science Communications seem to have some trouble understanding the nitty gritty of science: but it’s not their fault. That claim comes from your side leaf. Also the indigenous people of this country have up to 8 seasons usually defined by temps , plants or trees that are flowering or in fruit to weather etc . no… I responded to William. What are these sides you hold dear? Sides ?? You must mean the side backed by science and the side backed by soothsayers. You know no Ice in the Antarctic,no snow on the Oz alps , no water in the dams , sand dunes as Far East as Albury ,low yielding food crops , people starving etc etc etc etc etc etc etc . There was a global warming blip around 1740 which should be included if we are to grasp to meaning of everything. There was better weather all through the 1720′s and 1730′s but 1740 had a very cold winter (not as cold as 1709). There is a school of thought that Walpole’s ascendency as PM was helped by those favourable conditions, and the change was a catalyst for his removal. H. Lamb pointed out in the late 1970′s that up to 7 of the summers in the 1730′s were still in the top (10?) warmest on record. I notice that the same period was the start of the agricultural revolution in England as they started overwintering stock rather than slaughtering most. Many modern breeds of cattle, sheep and pigs originated then. Interesting Graeme – particularly if you look at the climate around the time of the start of the industrial revolution – mid 1700s, that is what the alarmist loons want us to return to. If I was living in the UK, I would be demanding that the AGW/MMCC and associated wind and solar pollution be banned and their rent seeking promoters be imprisoned. I would settle for them to be forced to live in a small tent on a Yorkshire moor in winter time, keeping a diary of the weather. They wouldn’t know how to survive that Graeme No.3. Harder conditions than the Darwin award lady who parked her caravan at the top of a cliff on the Atlantic-facing side of Ireland with a severe storm approaching. RIP. If it was a rented caravan (I know not) then I would have vacated it for a solid place overnight. Thanks Graeme, my bad, 1740 was bitter and the 1730s were anomalously warm. Its also worth noting that it was a bad call by Archibald. He’s caught it off the Weather Alarmists,,,,they are well practised in bad calls. Here is a contemporary observation of why the Indonesia dry season has continued without respite. ‘Pak Siswanto, the director of climatology at Indonesia’s Meteorological, Climatological and Geophysical Agency, said the weather conditions in Indonesia followed on from what was happening in its larger southern neighbour. “The dry season in Indonesia is actually forced by the wind circulation coming from Australian continent,” he said. I think the droughty conditions in Java are is to the eruption of Mount Agung last year, nothing to do with Australia. All this exposes the myopic view by alarmists. We can go back in our history and find many storms and other severe weather events far worse than what we’ve experienced over the past 100 years. That’s not to say we won’t experience them in the future – most likely we will. The point is the storms and other weather events we have seen in recent times have nothing do with CO2 emissions, and if they did they had the opposite effect of what the alarmists are claiming – so what’s the problem? Isn’t that a good thing if that’s the case? Of course it’s far more likely our emissions have at most an insignificant impact. In any case the alarmists are barking up the wrong tree. Morrison has to understand this is so expose the lies of the alarmists to block Shorten from becoming our next PM. Otherwise we will have our own severe localised storm – an economic hell. This whole idea that climate is unchanging was a deliberate corruption of the education system. As I have mentioned before, even when I was in grade 5 I learned about Ice Ages and Milankovitch Cycles and even the accepted wisdom of the time that we were coming to the end of a rare interglacial and heading toward another glacial period. In fact, they were correct the first time and we are almost certainly heading toward an extended period of cooling if not another glacial. I’ve seen other, generally lower, estimates of the navy’s dead. Not a big issue, I guess. Nasty set of circumstances. I do like the art work. Imagine being a witness to the events, and having the talent to show such a story. Anointed high priest shaman/shemen of the Klimate Khange Kult and their minion reporters repeaters shriek ‘n’ wail the seasons, the Earth, even life itself, has gone to the gods dogs due to Paleface Man and his evil CO₂ ways and, unless sacrifices are made, plagues of boils and frogs and flames and floods and night and day shall befall those who do not be-LIE-ve the Holey Writ of the UN Word! Have we really advanced since the witchcraft of the Middle Ages? The sacrifices of the Aztecs? The babes of Baal? An intriguing little pdf collection of similarities between the 1600s and the 2000s – with regard to appeasing the weather gods and goddesses and those more amorphous in-between wisps of not-quite-sure-isms. Where science and superstition are close neighbours… too close for comfort. To paraphrase Sir Robert Nesta Marley: Ya gots to know where ya’ll com from, mon, to knows where ya’ll goin’, all riot? Have we really advanced since the witchcraft of the Middle Ages? The sacrifices of the Aztecs? The babes of Baal? You wouldn’t think so. The Club of Rome and the UNFCCC are taking maximum advantage of most people’s gullibility to spread their propaganda. They want Power and, like all totalitarians, aren’t fussy how they get it. The hurricane double standard from Sandy to Maria. Notice the reference to the “world order”. Trump is massive stick jammed into the globalists bike spokes…. Unequivocally not so. Our current storm in the Carolinas is the worst ever in the history of the world to hear the superlatives being thrown at it. And without a doubt it is bad. But isn’t it amazing how we must always be living through the worst ever of whatever it is, whether storm or president, wind or rain, tall tale or fact…? Nothing outdoes the human need to get attention. So yesterday’s storm will fade faster then you can imagine while todays breeze becomes the worst ever in history. And the same is true of fires, floods, power outages and overflowing drains. Let us not forget those who have lost everything as they try to pick up the pieces and rebuild not just their homes but their lives. Because to them it is the worst ever. Former Vice President Al Gore compared the Trump administration to an experiment that’s “terminated early for ethical reasons,” in an interview with MSNBC anchor Andrea Mitchell that also touched on the upcoming election and man-made global warming. Mitchell did not question any of Gore’s climate claims, and eventually the interview turned to the 2018 election. Gore admitted that Democrats did not do a good job in addressing the “deep concerns and anxieties” of middle-income Americans. “You’re quite right that the stagnation of middle-income wages for more than 40 years has been largely responsible for this wave of populist authoritarianism that is now present, not only in the United States but in quite a few other countries around the world,” Gore told MSNBC’s Mitchell. “I’m a member of the Democratic Party and I will say both parties have to respond much more effectively to the deep concerns and anxieties that Americans have been expressing and they have not gotten the kind of response that’s needed,” Gore said. Gore said this failure resulted in Trump’s 2016 election victory. “This experiment with Trumpism is not going well,” Gore also said, adding he believed there are Trump voters who want to restore “checks and balances” by electing Democrats this November. Funny how things ( in that 40 year window ) never improved under 8 years of Communist Obama, but has improved greatly under right wing Trump…. Only 6000 dead? Nature was being gentle. The end of the Medieval Warming and the start of the Wolf Minimum (also the start of the Little Ice Age) saw some horrendous North Sea Storms. I’m using the term `The Little Ice Age’ to describe the climate fluctuations (some of them pretty violent) from the end of the 13 th (1300) through to 1850. Dr Brian Fagan documents the seven year famine of Europe when much wetter (and colder) weather descended on Europe and England in 1315*. The rain began, turning western Europe into a quagmire. August was cold, September worse. Crops were lost wholesale, whole villages washed away in floods, although oak trees rather liked the extra water. The 1316 crop was c. 56% of normal. Within months, famine began. Population of about 1.4 million in the eleventh century had risen to about 5 million during the Medieval Warming, without the communications and fossil-fueled transportation networks we currently enjoy. We are already starting to see similar low crop yields over the last twelve to eighteen months. And the Warmists are still sending out Ambulances after Virtual Warming, and hailing Cat-1 storms as the `Greatest Storm this Century.’ Sheesh. Intellectual Midgetization and Propaganda Enforced Gullibility at their worst. This was at a time when the average life expectancy of a rural farm worker, who survived childhoodlthood, was 24 years. Nutrition was marginal to poor and nearly all adults suffered from arthritis, so death was probably from over-work. Farms and cities lived from hand to mouth, so it’s not hard to imagine what a harvest of souls a single year’s famine would reap, especially given the usual parsimony of the wealthy. This was just the opening barrage of the LIA. There was a lot more to come. 1315 was the start of the Seven Year Famine. The 1315 rain was almost continuous from May through August. The wheat, oats and barley was hammered into the ground. 1316 was no better: the spring rains prevented proper sowing, the rains continued and the harvest failed again. Not only did people starve, so did their stock: cattle, sheep, goats, and horses. And, of course, food prices rose. Disease follows famine because of the poor nutrition. Survival of the new born was not good, nor of the aged. Farmland was abandoned because of lack of seed, draught oxen and villagers. 1316 was the `year of the mortality.‘ Mass graves become a norm. The rains continued during the summer of 1317. Edward the II’s campaigns against the Scots added to the taxation load of the countryside and raised Scottish rebellion. William Wallaces’ raids into Yorkshire to return Edward’s affection added further to the chaos and destruction. Belgium owes its independence from France to the 1315 rains. The army sent to bring them back under the aegis of France literally bogged down. The cavalry horses sank into the mud up to their bellies, and the infantry up to their knees. Military campaigns do not generally succeed in such conditions, which lesson had been forgotten by the time of the 1914-18 European War. To think we have all this wonderful weather and its effects to look forward to. Maybe Charles III will forego similar military campaigns. The English can hope. All well covered in the Goon show – Queen Anne’s rain. And who is the first in danger of drawing? Yes, … in Series 9, Episode 8. First broadcast on December 22, 1958. It would have been late 1959 before it arrived in The Colonies. Doesn’t history repeat? Nothing has changed at the Beeb,.. just what the Beeb is covering up. First broadcast on December 22, 1958. It would have been late 1959 before it was heard in The Colonies. What about the storm in the tea cup? What about the 1737 Calcutta Cyclone where the death toll was 300,000? Also the 1780 Philippines typhoon killing some 100,000 people? Also the The Great Backerganj Cyclone of 1876 killing about 200,000 people? Also the 1881 Haiphong typhoon killing some 150,000 people? Non Westerners do not matter. It’s only the east coast of the USA and Hawaii that matter. Oh how silly of me, I just remembered. Many years ago when I was in the US on a work trip I attended a presentation where the guy showed a PowerPoint slide with the title “The World”. It only had the US. I thought he was kidding but it turned out he was serious. What about the 2004 Boxing Day tsunami? Why does Met Éireann so rarely mention climate change? This question has long puzzled environmentalists. In interview after interview on extreme weather events, the state weather service steers clear of linking them to global warming caused by humans. A few weeks ago, Evelyn Cusack, Met Éireann’s head of forecasting, was on RTÉ to talk about the heatwave that scorched Europe this summer. Research by the World Weather Attribution network shows that climate change made this heatwave five times more likely. Dave has also worked at a senior level in the media in Ireland, for the Irish Times, Cara magazine and for various titles in Independent News and Media… He wrote a weekly column for the Irish Independent from 2005 to 2015 and had a weekly radio column on RTÉ’s ‘Drivetime’. Dave worked as an advisor to the Minister for the Environment up to 2011 and continues to be involved in local politics. He has also worked as a media trainer and non-profit consultant. Gibbons has argued that global economic recovery will be constrained by energy shortages, and he points out that the Irish economy, with its relatively high per capita use of energy, is particularly vulnerable to “peak oil”, the anticipated decline in global oil production. Met Eireann has been criticised by environmental campaigners for allegedly failing to tell the public how climate change is influencing Ireland’s weather. The country’s hottest summer in 42 years has come four months after snowdrifts of up to two metres left communities stranded without food, electricity or broadband. In October, Ireland was lashed by Hurricane Ophelia, the worst storm to hit the country in 50 years. Evelyn Cusack, head of forecasting at Met Eireann, was asked on RTE’s Morning Ireland on Thursday to explain the reason for the heatwave and drought. The presenter asked her: “Why is this happening? Why do we get a 1976 or a ’95 or a 2018?” Cusack said there was “no reason as such — it’s just variability”…. Hottest summer in 42 years…compared to what time line? 1000 years? 2000 years? And you want the Met to say what? There wasn’t a hotter summer in 1976? There weren’t worse storms prior to fifty years ago? Extreme summers and extreme winters shouldn’t come in the same years, though this is a common thing? Or what used to happen shouldn’t happen now, kind of like how we’re over slavery and flared jeans and hula-hoops and don’t want them back? Or once stuff used to just happen but now the same stuff happens because of “climate change”? The population of Britian less the quarter of a million in British America of the 1700′s is given as about 8.6 million people. Today the population of England, Scotland , Wales and Northern Ireland is given as around 65.7 million people. Or about 7.6 times the population of 1700. A similar storm today to that of 1703 would on those figures kill around 60,000 people plus. However the modern system of fast paved roads, communications and the ability to shift both men and supplies over hundreds of kilometres literally within hours would keep the death toll from such a storm today down into a couple of thousand and possibly into only a few hundreds today. But Britiain of course is not the only nation to suffer serious human life and resource losses from storms that originate in the North Atlantic and in the North Sea. I can still remember, vaguely it is true, I was 14 years old, the news papers publishing the photos and articles on the horrific aftermath of the Great Storm that hit the Netherlands on Jan 30th 1953 when Europe was just beginning to recover from the traumatic and immense human life losses of WW2. Engraved on the minds of many people living on the east coast of England is the freezing winter weekend of January 31 and February 1, 1953, when a high sea and high tide left a trail of death and disaster in the worst flooding in Britain this century. During the night of January 31 floods claimed 307 lives, devastated 200,000 acres of farmland, swept cattle, horses, sheep and poultry to their deaths and made 21,000 people homeless. Not until the next morning was it realised that the greatest peacetime catastrophe in this country in living memory had struck a normally peaceful countryside. Over 100 more lives were lost at sea, and 1800 were lost in Holland. Officially, 1,835 people were killed in the Netherlands, mostly in the south-western province of Zeeland. 307 were killed in the United Kingdom, in the counties of Lincolnshire, Norfolk, Suffolk and Essex. 28 were killed in West Flanders, Belgium. Far worse particularly considering the much, much lower populations of the times was the human life losses and destruction of so much land and resources from the immense Storms of 1287 and 1421 that breached the great natural sand barriers that had prevented the flooding of the Netherlands Zuiderzee. In 1287 a storm caused more than 50,000 to 80,000 deaths in the Netherlands. This out of a population estimated at around 800 thousand people in 1300. To lose over 6% let alone near 10% of a nation’s population due to a single storm must have been truly a major trauma for the peoples of the Netherlands. But in 1421 the Netherlands was hit with another devastating storm driven flooding event that again destroyed large parts of the then Netherlands that was at or below sea levels of the times with a death toll of an estimated 10,000 souls. So the British are far from alone in suffering immense historical human life losses due to storms. The british losses of life from North Sea storms pale into a less significant class when measured against the natural event flooding of the Chinese Yangzi river floods of 1931. The 1931 China floods or the 1931 Yangzi-Huai River floods were a series of devastating floods that occurred in the Republic of China. They were some of the deadliest floods in history, and together formed one of the most lethal natural disasters of the 20th century, excluding pandemics and famines. Estimates of the total death toll range from 422,499  to between 3.7 million and 4 million. If you want to see how the Dutch worry about similar events, go look at the storm surge barrier across the scheldt estuary. I visited it in 1980 when under construction. Phenomenal! Q: A moratorium on new coal mines would mean Australia would stop building new coal mines and expanding existing ones. However, existing mines would continue to operate under their current approvals. Do you support or oppose a moratorium on building new coal mines? Question 2: The Federal Government has a greenhouse gas reduction target of 26-28% below 2005 levels by 2030. Labor’s proposed target is 45%. The Greens’ proposed target is 63-82%. Do you think the Government’s target of 26-28% should be increased so Australia reduces emissions faster, decreased so Australia does less, or kept the same? The Federal Government has announced it will not proceed with any greenhouse gas emissions reduction target for its National Energy Guarantee policy. Do you think the National Energy Guarantee should include an emissions reduction target? Under federal environmental law, the government can decide to review existing environmental approvals in light of new information. This can result in the approval being revoked. Would you support or oppose the Morrison government reviewing the Adani coal mine’s environmental approval? Ch9, SBS, regional newspapers carrying the TAI poll story via AAP. Australian businesses want a long-term energy plan to focus on lowering prices, reliability and reducing emissions. CEO of Australian Chamber of Commerce and Industry James Pearson says businesses need investment security for decades, which can’t be achieved with the government at loggerheads over its policy. (Greens Adam) Bandt wants next month’s Wentworth by-election in Malcolm Turnbull’s former seat to be a referendum on renewable energy and climate change, and is calling on Labor and crossbenchers to back a Greens-led push to extend the renewable energy target. “So that while the next parliament works out what it’s going to do on climate change renewable energy doesn’t fall into a valley of death,” Mr Bandt said. The poll commissioned by the left-leaning Australia Institute polled 690 respondents last Monday also found 63 per cent of respondents support a moratorium on building new coal mines, with 26 per cent opposed. This winter was especially tragic for France. However, the horror winters and storms around the depth of the LIA did not mean the period was without deadly heat waves and droughts. They’re in the record. Sorry about no satellite in 1700, so we’ll just have to use the old loaf. It can’t bear repeating too much: humans have survived all kinds of extreme coolings (eg just 20-15 thousand years back), static and complex civilisations have only been around for a few thousand years and have had trouble coping with even very slight downward variations, as in the period around 1700. The real problem lies in the fact that nearly all of our geological period has been spent in temps well below those of the LIA, that there is nothing remarkable about our present interglacial, and that we must soon return to temps closer to our chilly Quaternary average. Well, I would call that a giant problem, in view of all the centuries of physical science which point to it. But most of us here are not allowed to reference science. We’re in the naughty corner. followup to Reachtel comment incl “Businesses want energy security: ACCI” is in moderation. Leaked memo shows BusinessEurope is preparing to resist a stronger EU 2030 emissions target, ahead of a key climate summit in Poland later this year. The memo from BusinessEurope (LINK), dated 13 September, shows how Europe’s biggest employer association intends to “challenge” EU plans to aim higher in the fight against climate change. When contacted by the Guardian to ask if they agreed or disagreed with the lobby group’s suggested opposition, UK business trade body the CBI, German conglomerate Siemens, French energy firms Engie and EDF Energy, and Japanese multinational Hitachi all failed to distance themselves from the proposal. Must have been caused by all those evil coal power stations back in those days! One problem with that. Today we have a lot more and many more to come. Although correlation is not necessarily causation, the alarmists are at best barking up the wrong tree (as usual). They should by now be proclaiming that coal fired power stations reduce the severity of storms and thus should be supporting more of them to be built not less. Of course we all know the left typically have their world-view up-side-down. Look at the BS this idiot scott morrison is spewing out with this global warming rubbish! NATIONAL SECURITY RISK, MY ARSE! We will have to wait a while more to see. We all know the LNP has one last chance to revive itself. He better pull out all stops or else he and his party will lose what’s left of the conservative base. He or his replacement can look forward to a dead party. Pickering seems confident that the PM will grow a backbone before Xmas. Ah socialism…The EUs wheels about fall off, it resorts to this type of stuff…. I hope he is right. I can understand why they are keeping their gunpowder dry for now but after the by-election is over they better start firing big time and demolish the ALP+Greens on energy policy, border policy and super. It is clear as day if Shorten becomes PM we can kiss goodbye to Australia’s economy. Morrison wants to settle in and use the by-election as a litmus test, to sell his ideas to the front bench. What the majors fear most is a rise up of independents at the next general election, enough of them to hold the balance of power. I’m not sure what you mean by the by-election being a litmus test. For starters it’s just one seat. The bigger picture goes well beyond that electorate. I don’t think there are that many conservatives there. It was a Turnbull seat and that says it all. As for the rise of independents that’s what I’ve been warning about for some time now. The conservative base are by and large sick and tired of the LNP flirting with the left. They are now waiting to see if Morrison will put a stop to that and turn thing right around. Otherwise not many conservatives will come back to the LNP so the more conservative minor parties like ACP and ON will grab hold of more voters. As for the left who voted for the LNP in the past, now that their friend Turnbull is gone some will support an ALP or Greens candidate while others will vote for a left leaning Liberal candidate. The end result is a win for the ALP unless the minor parties gain enough support to block the ALP from forming a majority government and instead grant the LNP to form government. It’s all so messy I sometimes wonder if it would be far better in the long run if we just let Shorten crash and burn the nation to teach everyone a few lessons once and for all about socialism. If the Libs lose the seat its because of the Green Square mob. So the storms of the past where 97% stronger than today’s? 18 Sept: CarbonPulse: CARBON FORWARD 2018: Will international carbon trade thrive under the Paris Agreement? This will include a session that gathers experts to give critical insights on how the CDM activities can be best placed to benefit under Paris, looking at the promise of unprecedented demand but multiple risks for investors looking to pick winners in the Paris era. The UK’s spot EUA auction failed on Wednesday, marking the third time this year that an ICE-hosted sale has been cancelled due to weak demand. These policies added US$30 billion to government coffers, with prices per tonne ranging ***from US$1 to US$133. (final line?) The World Bank’s chief executive says a carbon tax on emissions is necessary to fight global warming. all through the little ice age violent storms hit various parts of the UK. In the 1500s, Kenfig in south wales was buried beneath metres of sand. There is a great deal of historical evidence that storminess in the cool LIA was far greater than in the warmer MWP and indeed far greater than today. The reason is that the LIA was characterised by more wavy jet stream tracks creating greater temperature differentials between locations on the same latitude. That perks up middle latitude cyclones substantially. In the process, greater cloudiness is created and the Earth cools since more incoming solar energy is reflected to space. I have previously described how solar variations translate into variations in jet stream tracks by altering the gradient of tropopause height between equator and poles. Changes in the particle and wavelength proportions emanating from the sun act on the upper atmosphere differently above equator and poles so as to change the tropopause height gradient. One day it will come to be obvious to all. Appreciate your contribution to the cc debate. Stephen look at the coronal mass ejections and relation to extreem events. Stephen on what we know, are you prepared to make a decadal forecast? If the sun stays quiet I expect a gradual shift from a temperature plateau to a slow and irregular decline. Okay thanks, that is a fairly safe bet, with a strong La Nina around 2020 to lower world temperature. There has been talk around the traps that the hiatus may continue for at least another decade, where would that leave us? Also, in July 2017 the STR was firmly positioned too far south in the Austral winter, BoM highlights the problem. Within weeks of this announcement the STR lost its intensity, allowing more cold fronts to break through. Can I safely say the AGW signal in the southern hemisphere has vanished for at least a decade? At the height of the Little Ice Age. the G7 Halifax meeting, with US representation, and the call for a carbon tax by Kristalina Georgieva, World Bank CEO (***a position created by the Bank’s president, Jim Yong Kim) has been nagging at me since I posted it. HALIFAX — Canada’s environment minister said she’s no “quitter” despite calls Wednesday from David Suzuki for her to resign and a G7 meeting ***that didn’t shift her American counterpart’s firm opposition to the Paris climate agreement. WASHINGTON, D.C. – Tomorrow, September 20, 2018, U.S. Deputy Secretary of Energy Dan Brouillette will travel to Halifax, Canada for the G7 Energy Ministerial. While there, he will meet and have high-level discussions on global energy policy with his counterparts from the seven member countries of the G7. The Energy Ministers Meeting, first convened in 2014, provides a high-level platform to voice a collective G7 commitment to strengthen energy security and ensure that energy is used to enhance global security. Deputy Secretary Brouillette will emphasize energy security as a top priority for both the G7 and the Trump Administration, and underscore the Administration’s desire for a balanced approach to energy that protects the environment while promoting infrastructure investment and economic growth. The Canadian G7 Presidency is planning to issue a Chair’s Summary following the Energy Ministers Meeting, reflecting the Ministers’ discussions throughout the session. Countries around the world are seeing the costs of climate change first hand – from dangerous wildfires and invasive species to extreme weather events like flooding, droughts and record-breaking heat waves. The increasing toll of climate change at home and around the world, and the need for ambitious international action is why Canada identified climate action, oceans and clean energy as one of its priority themes for its G7 presidency in 2018. SOURCE Environment and Climate Change Canada. something I posted comments about at the time – the early, rushed re-appointment of Jim Yong Kim to a second term as World Bank president. The World Bank’s presidential appointment process unveiled this week points to a second term for Jim Yong Kim; it will also likely bar any possibility that Donald Trump, were he elected U.S. president, would influence who runs the world’s largest multilateral development bank for the next five years. In a board meeting on Tuesday, the bank’s executive directors approved a timeline, which is likely to result in the appointment of the bank president before the U.S. elections in November — and well before the next administration takes office in January. The World Bank maintains this year’s process is in keeping with past timelines. But a well-connected source who has not previously spoken out about the bank’s appointment process told Devex the current president is using the looming U.S. election to motivate the bank’s board to move faster. “Jim Kim has been basically lobbying … saying, ‘oh, you better choose [me] now before Trump might win and name somebody from his side.’ The entire process has been timed and planned … to finish before November,” said former World Bank staffer Hafed Al-Ghwell, citing conversations with members of the bank’s board of directors. Al-Ghwell left the bank in 2015 after 16 years. He served most recently as adviser to the dean of the board of executive directors, a position that gave him a front-row view into the presidential appointment process in 2012, which ushered Kim into his current role. Now Al-Ghwell has joined a growing list of former World Bank officials who criticize Kim’s tenure — and the process that is likely to reappoint him. “This flies against precedent, flies against the courtesy that has always been there for the next U.S. administration and the next U.S. Treasury secretary to decide who’s the president that he’s going to be working with,” Al-Ghwell said. In an unofficial agreement with European countries, the U.S. government, as the bank’s largest shareholder, traditionally selects the World Bank president. Clinton was a driving force behind Kim’s nomination in 2012, after other potential nominees — including economists Jeffrey Sachs and Larry Summers — failed to pan out. Kim, a medical doctor and co-founder of the NGO Partners in Health, shared a history of humanitarian work in Haiti with the Clinton family, and on at least one occasion urged Clinton to visit Dartmouth College, during his tenure there as president. He is also reportedly close to President Obama. The bank maintains that Kim’s 2012 appointment was the result of an open, merit-based process — principles the bank’s board of directors agreed to unanimously in 2011 — and they say the 2016 appointment process will reflect the same commitments. In some respects, 2012 did break from tradition. The bank saw its first-ever contested election, with two nominees from developing countries: Ngozi Okonjo-Iweala, the former Nigerian finance minister, and José Antonio Ocampo, the former Colombian finance minister. These two nominees participated in public debates, presented their prospective programs for consideration, and Okonjo-Iweala secured near-unanimous support among the bank’s developing country shareholders — known as the G-11. At the time, few of the executive directors were familiar with Kim, whom the U.S. had nominated shortly before the close of the nomination period, Al-Ghwell said. Next to two eminent economists, Kim seemed an unlikely nominee, and that reflected in the amount of support he initially received. “There was sort of an informal vote that was taken right in front of me — and I was actually the guy who counted it — of where everybody stands. It came in as 99 percent for Ngozi. Not one single vote for Kim,” Al-Ghwell said. The one G-11 vote that wasn’t for Okonjo-Iweala went to Ocampo. But when Brazil’s executive director informed Ocampo of the result, he agreed to drop out of the race and support Okonjo-Iweala, Al-Ghwell said. But the next day something happened. The dean of the board, for whom Al-Ghwell served as advisor, was among those to change his vote, and Kim became the 12th American man in a row to serve as president of the World Bank. “For me it was just a personal disgust, honestly, that this institution that I’ve served all these years, is going around the world … lecturing world governments on the importance of transparency, good governance, accountability … that this is the institution that is willing to play these games, and in a very blatant kind of way without anybody really batting an eye,” Al-Ghwell said. He is dismayed by what he sees as a similar process playing out in 2016, but with the possibility for even less genuine competition. “I find it really insulting,” he said. Al-Ghwell is not alone in voicing criticism of the recently approved nomination process — or of Kim’s fitness to serve a second term. “It’s a short process. The Americans want the renomination, so the incentives for really getting quality people to put their name in a process that looks to be predetermined is not very high. So the competitiveness dimension of the process is not likely to be met,” said Jean Louis Sarbib, a former World Bank senior vice president and the current CEO of Development Gateway. Devex reached out to Okonjo-Iweala for comment on the nomination process and whether she would seek another nomination to challenge Kim, but did not receive a response. Sarbib served as an advisor to World Bank President James Wolfensohn, whose reappointment in late September 1999 the bank points to as evidence that their current timeline is not out of step with the past. He told Devex that those inside Tuesday’s board meeting where Kim’s nomination was announced reported that it was attended by a large number of junior staff, who were filling in for executive directors still on summer leave. “This rushed process, given the fact that there’s still a lot of time left in Dr. Kim’s first term, is odd … It certainly does not give much time to come up with credible candidates, unless it is the intention of the Americans to propose more than one name,” Sarbib said. While it might be difficult for other countries to field candidates in time for the deadline, Sarbib thinks the U.S. should consider doing so — if the administration is going to nominate someone likely to fulfill the selection criteria set by the bank’s board of directors. “I’m afraid that Dr. Kim does not meet many of them based on his performance in his first term,” Sarbib said. According to Sarbib, U.S. Executive Director Matt McGuire cited Kim’s performance and the Obama administration’s support as reasons for his renomination in the Tuesday board meeting. Kim, in an emailed statement after Tuesday’s meeting, also defended his record and championed an open appointment process. “Together, we have accomplished so much over the past four years, and I would be proud to carry on this important work. The board is committed to an open, transparent process, and I fully respect the selection principles adopted by our executive directors in 2011 and followed in 2012,” he said. The window for nominations opens Thursday, Aug. 25 and closes Wednesday, Sept. 14. Consideration of candidates will take two to three weeks, according to a bank release. Editor’s Note, August 25, 2016: An earlier version of this article indicated that U.S. Executive Director Matt McGuire cited “the strong personal support of the U.S. president” as one reason for Jim Yong Kim’s nomination. Further inquiry suggests McGuire referred to the Obama administration’s support in general, not the personal support of President Obama. We regret the earlier characterization, which we were unable to corroborate with other sources. Environment ministers from the Group of 7 countries have confirmed all members, including the United States, must stand united in fighting climate change and driving clean growth. The G7 ministers met in Halifax, Canada, on Wednesday as a sense of crisis is growing around the globe over extreme weather events, such as flooding and record-breaking heat waves. Delegates from Japan and other countries explained their steps to reduce the use of fossil fuels in line with the Paris Agreement on climate change, while pursuing growth. Canadian environment minister Catherine McKenna, who chaired the meeting, said delegates were able to have a good discussion, despite a difference in position from that of the US. She stressed that fighting climate change presents a major economic opportunity. Japan’s environment minister, Masaharu Nakagawa, told reporters that the G7 members agreed to work together and strengthen their unity. Western (eurocentric historians) ignore Asia, disastrous Asian storms as posted above. Unstable jetstreams, due to low solar activity (e.g. LIA) causes extreem weather events, alows high and low pressure systems to develop more strongly. Electromagnetic coupling of the solar wind due to large coronal holes can cause storms (cylones hurricains typhoons) and earthquakes. more info here https://suspicious0bservers.org/. 1703 was during the Maunder Minimum at which time the price of wheat rose 400%. During the Dalton Minimum we had “1816 The Year without a summer.” A volcano in Indonesia threw so much ash into the upper atmosphere that we had no summer. Farmers planted their seeds but a freeze made their crops fail. The farmers planted again but still another freeze made their crops fail again. At that time there were only one billion people in the world. Today we have 6.6 billion more people than then. Best not to over populate your country as we enter yet another Grand Solar Minimum in 2019. It is the Eddy Minimum. During a Grand Solar Minimum cosmic rays actually striking the earth increases because the magnetospheres of the sun and the earth are less effective at blocking those rays (nuclear particles). This increases in cosmic rays has been linked to increased volcanic and earthquake activity.